Galerie anne-marie et roland pallade in Lyon was the place of an exhibition with artwork by Luc and François Schuiten. The exhibition took place from 11 December 2014 till 24 January 2015. Their drawings are similar, and they are sometimes confused, all the more so as they have signed some albums together. They share the same passion for architecture born of a common education, the same capacity to suggest through it spaces and a journey in time. There is, however, a profound difference in their approaches, which is the one that could be made between imagination and the imaginary. Luc invents and draws architectures and possible cities, based on future hypotheses and anticipation. He projects himself totally in this time-to-come, and through these images, he takes us with him into an active and adventurous exploration. The narration he sets up is that of the society in which we live, whose strings he pulls as far as he can, while preserving the notion of a continuity between the ages and the problems that we know and the one we see represented. We are like the characters who live in his architectures, invited to enter them, to climb up its foliage, to share the vertigoes they summon up, vertigoes simultaneously spatial and temporal, all the more impressive since these cities and architectures are careful to offer sufficiently concrete solutions to be envisaged as viable someday. On looking at them, we take place in those societies and in the organizations and habitats that they offer. However, the technical hypotheses that underlie these leafy cities, suggested with a certain precision, are not yet resolved. We are invited to carry them out in the future. Luc Schuiten is not a technician but a visionary and his drawings are inscribed in the rich tradition of the Utopian architects, which has nourished architectural and town planning reflection since the Renaissance. He uses his imagination in order to enlarge the real, to push back the frontiers of the possible, he uses it to project us via his drawings as far as possible inside humanity’s destiny, and that is indeed the source of the delicious sensation, of freedom and of emancipation of our limits, which they provide. 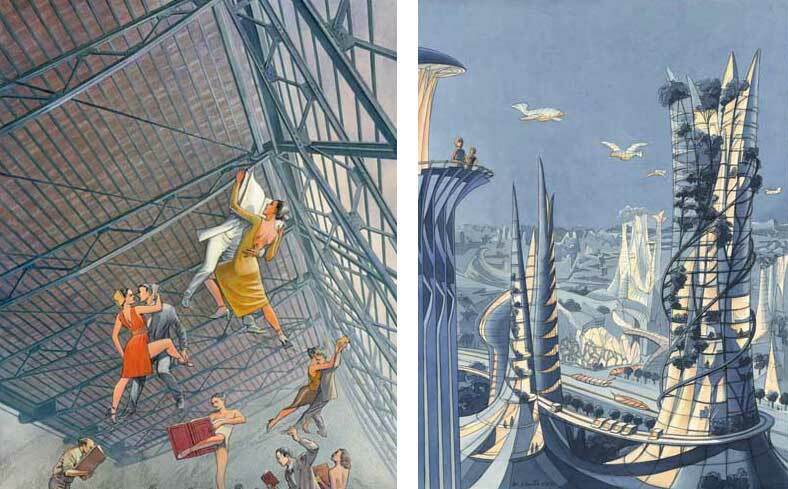 François Schuiten’s art settles into our imaginary without any other aim than that of pure delectation. With the same talent as a draughtsman, he offers a totally different approach. He reshuffles time’s cards and combines architectures of various periods, intermingling embellished memories of times past with suggestions for future civilizations, installing characters and building up a narrative. We are the amazed spectators of the scenery that he sets out and of his fascinating symmetrical tales, in mazes or in puzzles, that carry us off into a spacio-temporal walk-about, a source of dizzying sensations. 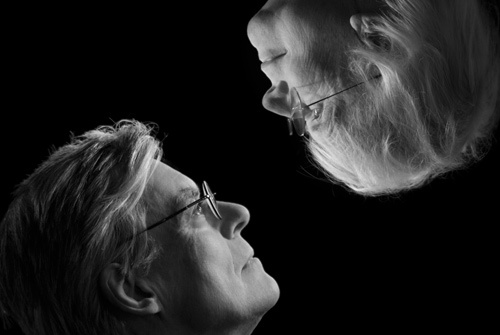 But there is not, in him, the slightest wish to show us a way towards a world to come, and dreaming is thus freed from any form of constraint: the brain no longer needs to encumber itself with the reality principle, it floats within the entertainment beyond the laws of physics and of morality, it gives itself up to the subconscious. A delightful eroticism, in fact, spices up these images wherein the past’s dust meets the future dawns to come, in magnificent stage sets, enlivened by characters wearing costumes taken from biblical times. The armed monumentality of that freedom can also tend towards frightening, chaotic images, associations that stir up the soul’s depths, unbelievable vertigoes, but all the more delightful for that. Such are the various orientations taken by these artists, born into the same family, and with the same education, Luc being twelve years older than his brother François, whose beginning he helped encourage by participating in his works, specifically with his advice and his contribution as a script writer. Galerie anne-marie et roland pallade posted a walkthrough the gallery on youtube. You can download the two parts of the catalogue. The catalogue is numbered 1-300.